Dogs have evolved alongside man, which has given them the unique ability to anticipate and respond to our needs. 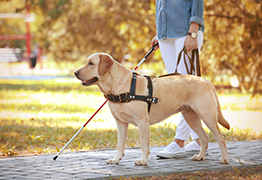 Whether providing us with sight, mobility, or emotional support, there is no question that dogs are man’s best friend, particularly when it comes to their ability to serve those with disabilities. However, sometimes it can be difficult for dog lovers to respect the needs of a working dog and handler – potentially putting the handler at risk. Listed here are 7 rules for interacting with service dogs. The natural instinct of dog lovers is to pet or interact with every dog they see. However, you should never pet a service dog that is working. Additionally, never assume a service dog is off-duty just because it is not wearing a vest or special harness. Depending on the dog’s job or the handler’s discretion (some handlers do not wish to advertise their disabilities), the dog may appear to be a house pet. Always ask before petting a dog (regardless of whether it appears to be a service dog), and respect the handler’s wishes if the answer is no. Sometimes our curiosity gets the better of us and we are tempted to ask questions such as, “what is your disability?” “how does your dog help you?” and, “how much did your dog cost?” Each of these questions is inappropriate, and it is important to remember that people with service dogs do not owe anyone an explanation or justification about their need for assistance. Unfortunately, there has been a large increase in people posing their pets as service dogs in attempt to give their pets access to public places. Not only is this practice illegal, but it has already had grave consequences for people with a legitimate need. Over the past few years there have been reports of service dogs being attacked by fake service dogs, humans being bitten by fake service dogs, and disabled handlers being treated unfairly due to increased skepticism by business owners. A distracted service dog is not able to properly perform its job, and food is considered the top distraction. Even though service dogs are highly trained, at the end of the day they are still dogs. Never offer food or treats to a service dog that is on duty. Service dogs are remarkable, highly trained animals. It can be tempting to praise a dog for a job well- done. However, you should always respect that the handler and trainers are the only people who should praise a working dog. Similarly, a service dog will never be perfect 100% of the time. If you believe a service dog isn’t behaving properly and the handler doesn’t seem to notice, politely alert the handler to the behavior. Please note that napping is not considered to be a bad behavior, as all dogs require rest. An example of a time you should alert the handler is if the service dog strays away and nudges you. If you encounter a service dog while on a walk with your own pet, ignore the handler and working animal. Some pet owners believe this encounter is a good time for socialization, since service dogs are well-trained. However, it is unfair to disrupt a working dog for your own pet’s benefit, and it may put the handler and one or both animals at risk. Service dogs are technically considered to be medical devices and they are protected by the American Disabilities Act. Treat a service dog’s presence in the same manner as you would a glucose monitor or oxygen tank by respecting the owner and ignoring the dog. Ultimately, service dogs perform incredible tasks to improve the quality of life of their handlers. To allow the dog to perform its best (and to avoid putting the handler in danger) it is important to ignore the dog and never be distracting.